I’m assuming The Joker will be this Halloween’s The Crow. Or at least this year’s Jack Sparrow, don’t cha think? Also, HAPPY HALLOWEEN everybody! Hope you’re eating lots of candy as you read this. Heh heh. The crow. Every convention I go to, my wife and I always jokingly wager how many ‘The Crow’ costumes we’ll see. I’m amazed it’s still relevant. wow, i’m amazed too. maybe jefbot’s crow costume’s not as outmoded as previously thought. the crow 2009! Although you do make for a good (The) Crow, I think this costume befits you. You’re right about Heath’s Joker costume. We’ll see lots of ’em this Halloween. See ya tonight for Trick-or-Treating. yep, we’ll be seeing a lot of jokers tonight, bested only by the amount of sarah palins. Very innovative costume morph!!! 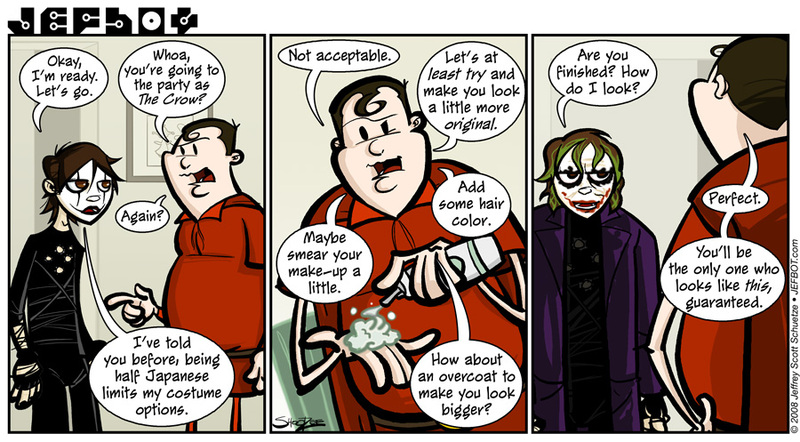 And so true… There will probably be a Joker costume on every corner… Excellent job Jefbot!!! maybe there’ll be a few batmen to round them all up. isn’t xeba banned from the trick-or-treating!? what is that other dude supposed to be? maybe cornacchia can tell you. Oh, but I’ve already been to several small conventions that I don’t really expect to see folks dressed up at at all, and there’s always been several Ledger Jokers — so, it’s already the next Crow. I can’t say I’ve seen any Crow’s at any conventions I’ve been to this year. did you see Dwight Shrewt as the Joker? If I was dressing up I might try to be Dwight as the Joker. Allegorical costume, ftw! unfortunately, i still have a couple episodes of The Office sitting on my dvr, but that sounds like a great idea! ha! that’s awesome, HereticHero. maybe he can psychoanalyze himself. I hope she wouldn’t mind, seeing how kickassular I drew her. Plus I had the character dressed up as her be a character with about the same personality. Tomix, i LOVE it! you totally captured Xinda’s personality in your drawing. i think this is the first time another artist has interpreted a character from JEFbot, so i’m doubly stoked. can’t wait to see what my sister thinks about this… heheh. definitely “kickassular”! jAnonymous, unlike most of the bot family in recent storylines, the Cornfather’s motives are pure, and isn’t being devious intentionally. So funny, bot!! I was at a party last night and there were at least 3 Jokers there. I love it! You really captured both the Crow and the Joker. Oh and Seth 6, check out this website to see what the Cornfather is wearing: http://www.youtube.com/watch?v=Z-rI1HQAoTE. i’m with you, B_! it’s easy to do and i like the character. maybe i can get away with it next year. I think my avatar might just say it all. Yeah, the Ledger Joker is the new Crow as far as halloween goes. But I hope to see more variants (I like the Dwight as Joker idea above), I saw some Nurse Jokers, and I think that is the way to go, a bit more specific, I’d love to see Bank Heist Joker with the clown mask over the joker make-up or Negotiation Joker with the grenades in the jacket and you carry around a pencil, or Truck-Wrek Joker where you’re a bit more deshevled with a big gun and you stagger around.